Here's what we have on tap today: YA paranormal novel (the first in a trilogy). A mysterious excerpt that leaves you wanting more. And a giveaway. Happy Monday! All in one day, her dad died, she met a demon, and her mother rejected her existence forever. After all, the demon who killed her dad was there to take her, and all because of her stupid powers—the ability to conjure blue flames. 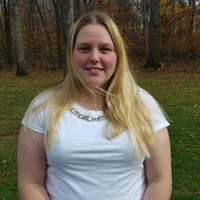 After moving to Idaho to live with her grandparents, Jasmine has a new life. Almost nobody knows about her powers, and she’s just a normal teenager with normal problems. Then comes her eighteenth birthday—and the earthquake that changes her world forever. When demons claw their way to Earth, Jasmine is surrounded by hundreds of fire-eyed beasts. Worse, she is captured by a big-shot demon named Bael. He’s a tricky foe with a chip on his shoulder—and the desire to make Jasmine use her powers for evil. Amon is a fallen angel with an attitude—and everything to lose. Successfully escaping the underworld undetected, Amon is on a quest to regain God’s grace when he rescues Jasmine from the clutches of a particularly nasty demon he knows all too well. The attraction between him and the not-entirely-human captive is instantaneous. Heavenly sparks fly, but ideas of romance will have to wait. First they have to stop thedemon race from wiping out the mortal realm. Humanity’s fate rests in their hands. Can two troubled angels rise above the flames to ensure a future for mankind? Or will Jasmine and Amon’s souls be bound together—in hell? “What was that noise?” Jasmine asked, coming around the front of the car. Dad was crouched down, inspecting the tire. “What noise?” Dad asked, looking up. “Mike, don’t tell me you didn’t hear that shrieking whistle. It was so loud,” Mom said. “I’m not sure, but I think it has something to do with me.” The man’s voice was raspy, but smooth, like silk torn to shreds. Jasmine’s spine stiffened, and goosebumps ran down her arms and legs. She turned slowly, just like in a horror movie, only to see the silhouette of a man behind her. Fog surrounded him, hiding his features. Jasmine inched backward. Her body tingled as her power moved through her, but she pushed it back again, not sure why it kept trying to get out. She never let it out anymore, and it never tried to escape. Not like this. She took another step backward, hoping the man wouldn’t notice her. Her phone was in the car, and this guy was crazy. They were going to need some help to get out of this alive. Maybe the police would make it in time. If only she could get to her phone. 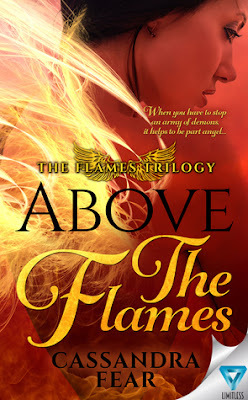 There is a tour-wide giveaway (open INTL) for 1 (one) signed copy of Above The Flames by Cassandra Fear. This giveaway ends May 12. This sounds like it's going to be a great trilogy. Love the cover. The book sounds fantastic, and I love the cover. Thanks for having the giveaway.